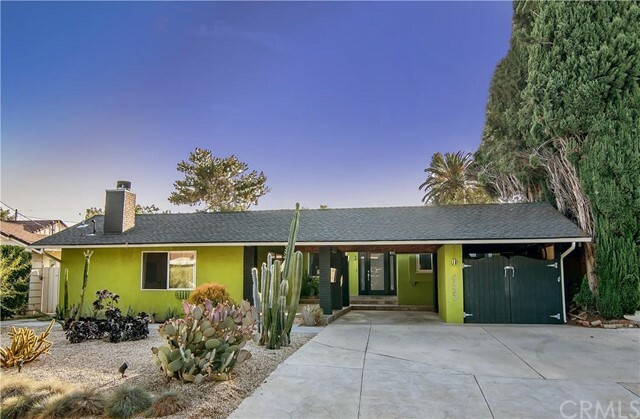 Mid Century Modern on a quiet street in the heart of Chandler Estates. This chic single story home has just undergone a complete remodel. Offering an outstanding open floor plan designed for entertaining, the indoor/outdoor flow is perfect for living the LA lifestyle. Inside you will find an expansive living room with dark hardwood floors, a glass fireplace and double French doors to the patio and pool. The sleek new kitchen features appliances by Viking, Wolf and SubZero (including a wine fridge), Ceaserstone counters, a marble island with breakfast bar, and walnut cabinets. The basalt floors flow into the media room with another fireplace and vaulted ceiling. One of the bedrooms is currently used as an office and has an adjoining bathroom. The stunning master suite has two walk in closets, dual sinks in the bathroom, a deep jetted tub and French doors out to the pool. Two additional bedrooms share a full bath. Outdoors is a truly magical private space with a pool and spa, outdoor kitchen, al fresco dining area, and plenty of room to play on this deep lot. Minutes to shopping and trendy restaurants.